It’s always a bit of a surprise to remember that Emily Dickinson had only ten poems published in her lifetime. It was not until four years after her death in 1886 that the first volume of her works stunned the literary world with their avant-garde and almost radical use of language and punctuation — long live the dash! — laying an important part of the groundwork that would usher in what we now know as modern poetry. A confluence of Dickinson-related events is a current reminder of her lasting impact. 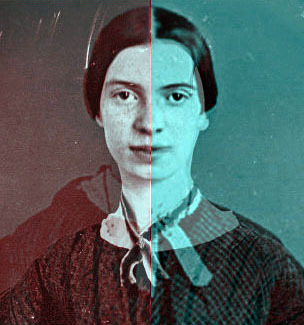 For the first time, thousands of manuscripts held by such institutions as Harvard University and Amherst College have been assembled on the Emily Dickinson Archive, an online collection where scholars and poetry lovers alike can scour the majority of her writings. “To have all these manuscripts together on one site and to have it so thoroughly searchable is extraordinary,” Cristanne Miller, a professor at the State University of New York at Buffalo and a member of the project’s advisory board, recently told the New York Times. Perhaps even more interesting for Dickinson aficionados is the publication of The Gorgeous Nothings, a compilation that consists of assorted envelopes and other pieces of reused paper that Dickinson turned to as palettes for her writing later in life. (Some are also featured in the exhibit, Dickinson/Walser: Pencil Sketches, at the Drawing Center in Soho, New York through January 12.) 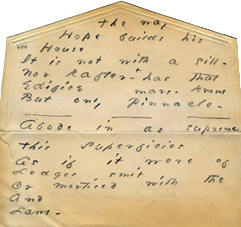 Another window on her enigmatic mind, the “envelope poems” appear on scraps of varying shapes and sizes (one is shown at left), all in that distinctively elusive handwriting, a spontaneous hybrid of cursive and block. It was after 1875 that the famously hermetic Dickinson ceased to create clean copies of her poems, and opted to pen (or rather, pencil) her thoughts on all kinds of available household paper. 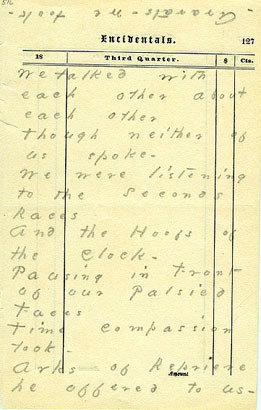 The most striking for me was seeing the beautiful line — “We talked with each other about each other though neither of us spoke” — on a run-of-the mill ledger sheet (right), timeless words which she also later rewrote on a scattered envelope.